I love getting down and dirty with toddler crafts. Honestly, the messier the better. It sparks creativity, it makes memories, and if I am being honest? My house is never cleaner than it is after my toddler does a craft. Some moms go nuts and clean before a guest arrives? I clean like a beast after my toddler does a craft. My inner Marie Kondo erupts and I just go nuts. I reorganize the art cupboard. Clean the dining room table. The house shines. So of course that means I love to go nuts and let the kids get messy with it. This year I wanted to give the toddlers the chance to have a lot of fun. So I chose to do shaving cream hearts. It is fun, messy, and I have all of the materials already at home. Hello Wonderful is a great blog that features some really great crafts and activities. 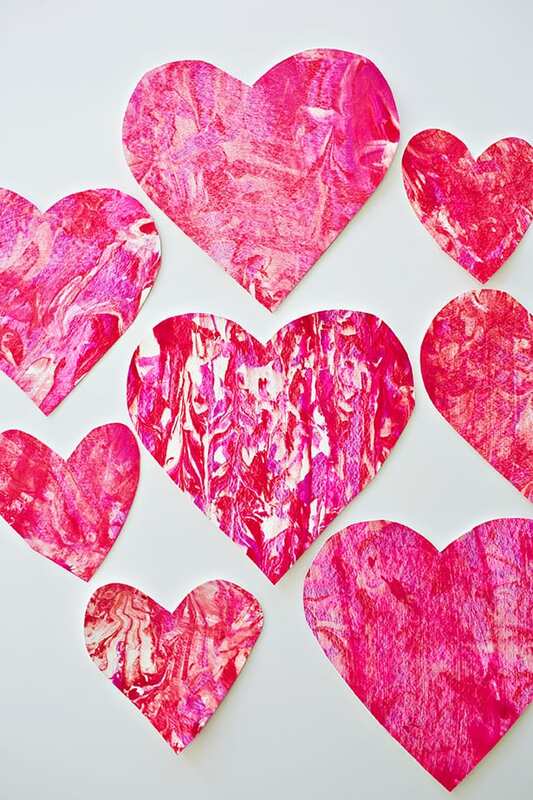 They have a simple and straightforward Marbled Heart activity that uses shaving cream. My son loved this. It was messy, fun, and incredibly creative. Every heart turned out differently. We made one for each of his siblings and for Mom and Dad. Come Valentine’s day we love to exchange gifts as a family, and now he has something to give too. Be sure to check out Hello Wonderful’s other great tutorials when you head over there to get the full Shaving Cream Heart Craft. Happy Valentine’s Day! This entry was posted in Activities and tagged Activities, marbled heart craft, shaving cream art, shaving cream heart cratft, toddler art, toddler crafts, toddler valentines crafts, valentines crafts on January 28, 2019 by Lacy.